City Councillors from all political parties were present at a Fairtrade breakfast at the Spurriergate Centre in York. 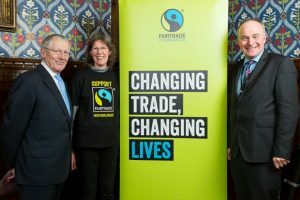 Local politicians met with Fairtrade supporters and representatives of Fairtrade businesses to celebrate Fairtrade Fortnight and York’s status as a Fairtrade City. The event was organised by the York Fair Trade Forum. The Spurriergate Centre is the ideal place for meals and refreshments on any visit to York and there’s also a dedicated Fair Trade shop. 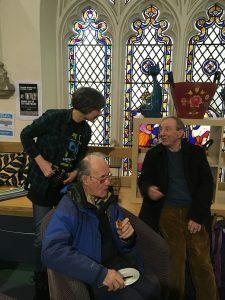 Fairtrade York supporters Pam Hanley, John Whitworth and Clive Dawson at the Spurriergate Centre. 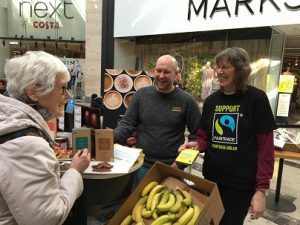 Bradford marked Fairtrade Fortnight in a big way with events taking place across the city; including a Fairtrade breakfast at the Cathedral and tastings at the University and at the prestigious Broadway Shopping Centre. At Broadway free Fairtrade tastings were provided by M&S. 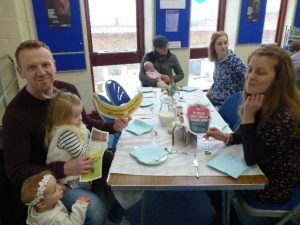 Two fabulous Fairtrade Birthday cakes were ceremonially cut and shared at the Fairtrade breakfast after a delicious feast produced by farmers from Fairtrade co-operatives and from Yorkshire. The place was abuzz with over 80 happy breakfasters keeping the volunteers very busy. Media interest started before Christmas with plans for a February feature on Fairtrade in Cherry Burton. This was in a large format local glossy magazine, ‘The Journal’ which has a wide circulation. BBC local radio also got in touch to find out what Cherry Burton was up to. They broadcast several live interviews with event organisers during the Fortnight. A preview of ‘Come On In to Fairtrade in Cherry Burton’ was published in Beverley Life, the monthly local paper. 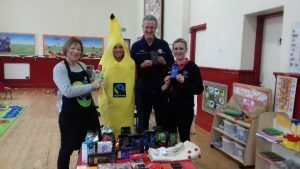 The village shop had a special Fairtrade display and increased its range of Fairtrade products. 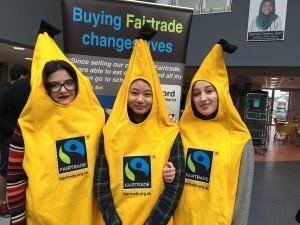 The ‘Bay Horse’ went all out for Fairtrade with Fairtrade displays, balloons, bunting, and a menu featuring Fairtrade desserts. 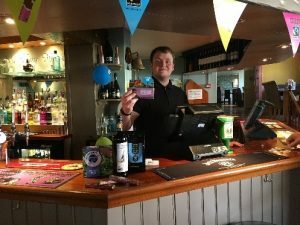 They also held a Fairtrade coffee morning and raffle as a fund raiser for Fairtrade adding significantly to the collecting box that had been on the bar during the Fortnight. Customers at ‘I Love Kitchens’ were invited to ‘Come On In’ with Fairtrade tea, coffee and cookies. Cherry Burton Primary School started the Fortnight with a whole school assembly on Where Our Food Comes From’ and Fairtrade. Children imagined they lived in Malawi and found out what a difference Fairtrade had made to sugar farmers and their families. Pre-school had a week of activities including Fairtrade baking and a Fairtrade banana picnic. 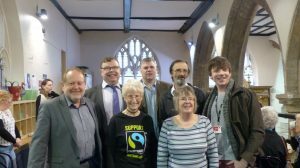 Worship and sermons focussed on Fairtrade issues at St Michael’s church. 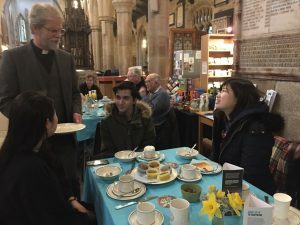 This is a Fairtrade church which hosts the village Fair Trade stall on Sunday mornings after the morning service when everyone is relaxing and chatting over Fairtrade coffee and tea in the Centre. 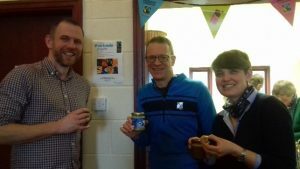 This year the Rector ran an additional evening taking ‘A Closer Look at Fairtrade’ in the Centre with Fairtrade tasters – coffee, tea, chocolate, nuts, banana chips, raisins and apricots. Much of the village integrates Fairtrade year-round. It is this widespread engagement with and support of Fairtrade that has enabled Cherry Burton to continue to be a Fairtrade Village since 2003. 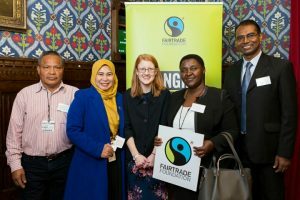 MP’s were invited to ‘come on in’ to Fairtrade at a special event held at Westminster. Mahyana Sari – Secretary, Arinigata Cooperatives, Indonesia (coffee producers); Marcial Quintero – Coobana, Panama (banana growers); John Joseph ­– Founder and Chairperson, WOFFA, India (coffee producer) and Ketra Kyosiimire – ACPCU (Ankole Coffee Producers Cooperative Union), Uganda. The gathering was joined by business guru, Fairtrade Ambassador and former Apprentice star, Nick Hewer. 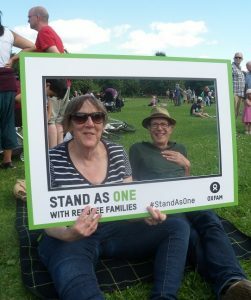 In total 88 MP’s and Peers attended the event; a larger number than expected, which led to the Fairtrade icecream running out. 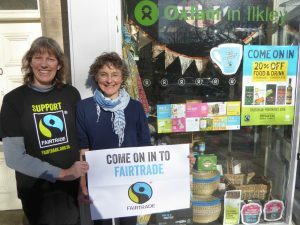 Oxfam Shops across Yorkshire celebrated Fairtrade Fortnight with window displays and special promotions. During the fortnight Fairtrade Yorkshire’s Karen Palframan visited her local Oxfam shop in the lovely town of Ilkley. Karen Palframan (left) and the Chair of Fairtrade Ilkley outside their local Oxfam shop. 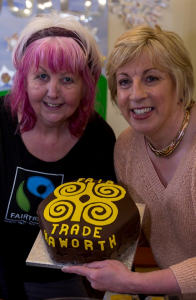 Fairtrade Village, Haworth held a bake off competition to celebrate Fairtrade Fortnight. On the 3rd March the Little Haworth Bake Off took place and the event was honoured by the appearance of celebrity judge, Sandy Docherty. Sandy was a contestant in the 2015 Great British Bake Off. Tables were turned, with Sandy judging Haworth residents’ baking. Residents were charged with the task of baking using Fair Trade ingredients and there were many very successful bakes.